In Karnataka, the SELCO Foundation has deployed solar-storage remote microgrids to provide energy access in Baikampady Mangalore, Neelakantarayanagaddi Village, Mendare Village, and Kalkeri Sangeet Vidyalaya. Each of these are DC microgrids. 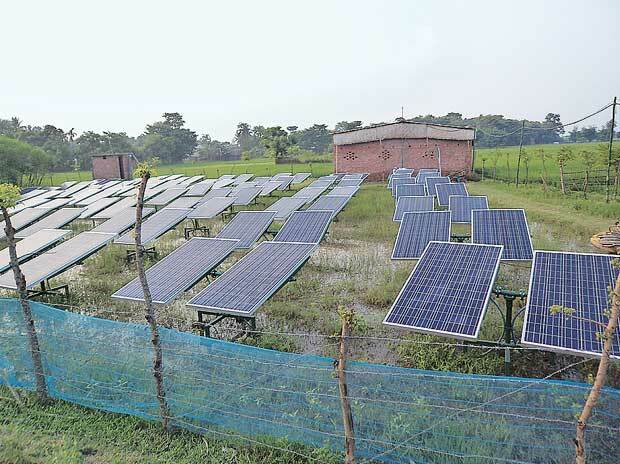 Mera Gao Power Company builds, owns, and operates solar micro grids in Uttar Pradesh, India. It primarily serves off-grid villages with high quality, dependable lighting and mobile phone charging services. Mera Gao Power’s model aims to provide power at low cost design make it viable for rural poor households. Started in 2010, the company has been able to provide its electricity services to more than 1500 Villages till now (1). Gram Power is a startup by University of Berkeley alumni Yashraj Khaitan and Jacob Dickinson. Gram Power is building 5-10 kilowatt micro-grids in inaccessible villages of Rajasthan and providing users with “smart meters” that allow them to regulate their power consumption. This allows rural users the flexibility to recharge their power, much in the same way as they recharge their phones. In 2012, Gram Power had set up their first Solar based smart micro-grid in Tonk, Rajasthan. Since then, the company has built more than 30 such micro-grids in Rajasthan (2). Greenpeace foundation started the solar micro-grid journey by installing a 100 KWp solar based micro-grid in Dharnai Village. The micro-grid in Dharnai powers the 450 homes of the 2,400 residents, 50 commercial operations, two schools, a training centre and a health care facility (3). In addition to these domestic companies and NGO’s, leading multinational corporations, such as ABB, GE, Schneider Electric, Caterpillar, and Siemens, are investing heavily in micro-grids across the region. Anbaric Transmisson, Eaton, Exelon, Honeywell International, Northern Power Systems, NRG Energy, Pareto Energy and Spirae are also actively working to expand their microgrid activities.